So today. Well, this morning when I called the hospital first thing they told me that Ava was currently sleeping but had woken up previously and had been very irritable and hard to settle. Because of this they decided to start her on a morphine infusion, to see if a constant steady supply of morphine would better manage her pain, if pain is indeed her problem. I thought I had better head to the hospital, so after Jason did a quick Sunday devotional with the kids I left to go see Ava. And Ava seemed settled when I got there, so that was good. But I hadn’t been there long when I got a call from Jason telling me that a child at the Ronald MacDonald House had come down with chicken-pox. Now this might not seem like a big deal, but when you living in a big house full of immune suppressed kids, it’s not a good thing. So in order to control it, the RMH has cancelled every gathering for at least 5 days…. meaning no summer program for the kids this week, no craft room and no ‘Home for Dinners’. Oh man! It was certainly a depressing thought for Jay as it meant he was faced with keeping the kids occupied this week without any help from the RMH, and probably not much help from me seeing Ava hasn’t been feeling well. Something had to be done, so after a quick phone call, we packed up Jason and the kids and they left after lunch today to join family at a cottage up north for a few days. It was perfect timing and I’m so glad that Jason and the kids will actually have a fun couple of days, rather than stay here and be bored. And I was glad I was able to stay late at the hospital tonight, because Ava woke up around 6:00 pm and was happy to be off her CPAP and sat in my lap and looked around for quite a while. I thought she was tired out soon after and tried to put her back to bed but she didn’t want to settle, so our really kind nurse suggested taking Ava for a walk, and Ava loved it! Now, I think I mentioned that they put Ava on another infusion of a anti-anxiety med the other day, Midazolam, but after looking it up tonight I’m going to request we stop it, because when Ava is awake she seems a little stoned and I don’t like it. Plus, I think she is just as irritable on it as she was off of it, if not more. Anyway, after Ava’s walk she was finally happy to go to sleep which I was happy to see. So it seems that she was feeling better tonight, but the real test will be tomorrow when her big diuretic will have worn off and she just might retain more fluid again. I hope not! It must be everyone’s prayers, but I feel at peace tonight… even with my family away and my baby not doing that great. Isn’t God good? It’s a new week and we’ll just wait and see what God will do. Again, we appreciate and covet your prayers! Oh our Ava. This morning I got a call from the hospital at 5:00 am to tell me that Ava wasn’t doing well again. I made my way over where I found her once again with an elevated heart-rate, a fever and on oxygen with her CPAP. They had already given her morphine and had put ice on her head, so her temp was already coming down and she seemed much better quite quickly. When the nurse practioner came to examine her at 9:00 am, she found that Ava’s liver was huge and congested with fluid, and so it seems that Ava is the poster child right now for congestive heart failure…. 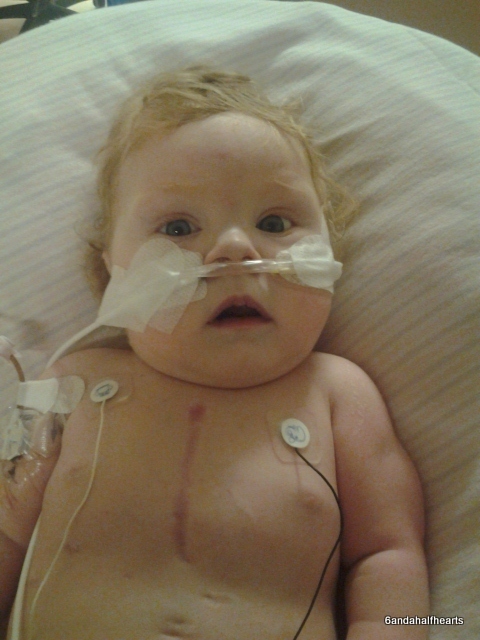 her heart can’t move blood around effectively and fluid is backing up in her liver. Ava had been given extra diuretics on Thursday and yesterday afternoon it really seemed like it was working, as she appeared to be feeling better and actually smiled for me. She was awake and content for a bit as well, so we were getting hopeful that things were looking up. But I guess when that when that drug wore off last night, the fluid started to back up again. And unfortunately I really think that when Ava’s liver is huge it hurts her. There is another mom on our floor whose daughter is 12 and is also waiting for a heart, and she said that when her daughter’s liver is huge, it makes her daughter cry it hurts so much. And Ava today seemed to be in pain, and when she was awake she was whimpering and crying and was very hard to settle, even with morphine. And it breaks my heart but she doesn’t even like to be held when she doesn’t feel well… and that makes me feel helpless. I don’t normally go back to see Ava after dinner, but tonight I did in case she woke up again and was unhappy and hard to settle. But I was pleased that when she did wake up she wasn’t upset, and even though she still looks puffy she seemed way more comfortable. She sat in her bouncy chair and I gave her some milk to drink, and then she actually did let me hold her for a while, which was so wonderful. And then she wanted to go back to sleep. Her heart rate was low and her sats were great and she settled quickly, so I am hopeful that she will have a good night tonight. This waiting is hard! And it’s taking its toll. I’m feeling a little down…. and I think Jason and I are both a little afraid of what might be coming. But then I don’t really want to go there when Ava just might rally and God might send a heart. I sent out a prayer request to our church today and I’m so thankful for people praying and like I keep saying, we don’t know what the Lord has in store… and we know He’ll see us through. But this not knowing and living the reality of that each day is exhausting. So please keep on praying for our poor baby, and pray for us as we wait. It has been so crazy around here… crazy and busy and I’ve been so tired, so I apologize for not blogging. Kinda crazy too because Ava hasn’t been doing that well. Too be honest when I saw her yesterday afternoon I was pretty sure that we were losing the fight. Ava’s heart-rate was up and she had a fever and was restless, and nothing seemed to be working to calm her down. They had tried morphine and a sedative and Advil and Tylenol and she was still restless and irritable. Her feet and hands were dusky and she is still so puffy, I know she is still extremely fluid over-loaded. So yesterday afternoon was really hard, and very very emotional. So when the PACT team came by, we discussed how to keep Ava more comfortable and they thought that maybe pain wasn’t Ava’s problem, but maybe she was feeling anxious, with breathing being so difficult and with her heart not working well. So we decided to swap out morphine for some anti-anxiety meds. We gave her a dose right away and it seemed to help and that was great. She woke up a little later and even though was calm, you could tell that she was a little befuddled… the cocktail of drugs that she was on was a bit much I think. And then I just start feeling bad for her. She hasn’t really smiled in days and I know she’s not comfortable, but waiting for a heart is like having a carrot dangling in front of you… you don’t want to give up the fight in case the heart is right around the corner. But once again I was praying that if God was calling her home, that she would just go, that we wouldn’t have to take drastic measures like turning off her heart meds or take away her CPAP. Jason and I both don’t feel right about doing that, and really, I know that neither of those things can really keep her alive if it is her time to go, so I take comfort in that. And then just before I left the hospital yesterday, when I was feeling so low…. the Cardiologist Fellow came in. He is from Singapore and he is wonderful and kind and really knows his stuff, and he’s a believer to boot!! He said that he thinks that Ava needs to lose about 400 grams of fluid and once he can get her back to real or ‘dry’ weight, she will feel so much better. And then once again I feel kinda astounded by God. Here all afternoon I feel like I need to prepare myself to let Ava go and the writing seems to be on the wall, and then a doctor comes in and says that he believes there is still hope, and what he is saying makes sense. And then I realize that when I try to guess at what God is going to do I never seem to get it right. I just need to have faith and wait. And Ava had a good night last night, but this morning at 6:00 am she was awake and really restless and irritable, like she never really has been before. Again they gave her every drug they could to relax her and finally she slept again. And then later this morning when she woke up I gave her a little bit of milk to drink, like I always do, but when I was done she freaked out. So I gave her a little more and she drank it like she had never seen fluid before. It kinda dawned on me that maybe she was just incredibly thirsty. Which would make sense… she has a set amount of fluid she is allowed to take in during a day, so when she started IV antibiotics last week, they took away fluid from her feeds so it wouldn’t be too much. But IV fluids tend to collect in wrong places, and that is probably how she got fluid over-loaded. So now they are trying to dry her out, so they haven’t given her all her fluid back to her and so she probably is thirsty poor baby – thirsty like every other cardiac kid on the ward. 🙂 But hopefully in a couple of days she will have lost this extra fluid and we can increase her feeds and she will feel better. That is the hope, we will see what happens. I know I don’t have to ask you to continue to pray, I know everyone is praying. God has been so good and so faithful, and I know that He is carrying our little Birdy under His wing and I know He cares for her so much. And my friend Christa posted this poem in my comments, but in case you didn’t get to read it, I thought I’d put it here… it’s so perfect. Things don’t just happen, they’re planned. But looking to Jesus instead. The blessings, as well as the strife. These past few days have been crazy again! And it was good to be home for a bit, but I won’t lie, being home is also stressful. Stressful in the way that when I’m there I just want to stay, but then I’m torn because I miss Ava. And Erik was started to say how he just wanted to stay home and was starting to say it a lot, and so yesterday Jason and I decided since home is just not our reality right now, it would be just best to head back to Toronto. We did leave rather late last night, but usually when you leave late at night there isn’t any traffic so it works in your favour. But not last night! We hit construction around 11:30 pm on the 401, so had to take a detour, just to hit downtown Toronto at 12:30 am. And it seriously could have been 12:30 pm, it was that busy. We weren’t sure if a show or a game had just gotten out before we arrived, but there were people and cars everywhere which definitely slowed us down. We finally got back to the Ronald MacDonald House around 1:00 am… fun. This morning I was so tired I called the hospital at 8:00 am to say that I would be shortly and to check on Ava, and was reassured that Ava was fine. But then around 9:30 am I received a phone call from Ava’s nurse to say that Ava’s heart rate was up, and with that her temp was coming up and she spiked a fever of 39 degrees and I should come in. Oh Ava. And to make matters worse, when I got to the hospital, I found that they decided that Ava needed to be watched more, so they moved her out of her private room and into a true “step-down” room where there are 4 children and two nurses who never leave the room. This was upsetting because if we aren’t in our own room our kids can’t come and visit Ava, and if Ava can’t wait for a heart, this might be all the time we have with her, and it would be very hard if we couldn’t all be together. So the end the day saw Ava back in her own room. The poor girl slept most of the day today, she clearly wasn’t feeling that good, and because of the fever they took more blood cultures from her… this probably makes 100 blood tests in the past weeks. They just can’t find any infection. We did have that one positive culture the other day, but it may have been a one-off because nothing else has ever been found. She seems to be showing signs of infection, but I’m starting to have my own theory. I’m wondering if Ava is in some kind of pain, which causes her heart-rate to go up, and because of her heart-failure, the increased heart rate actually causes her temperature to rise. This would be opposite to the premise that usually applies, that an increased heart-rate is caused by a fever. Who knows, I’m certainly no doctor, but when I called tonight at 9:00 pm to see how Ava was, her heart rate was back up into the 170’s, so I asked the nurse to give her some morphine. I called an hour later and her heart rate was back down to 140. So maybe Ava is in pain. I would like to try to keep her pain free for a day or two to see if we can keep her heart rate down, and just maybe, that will keep the fevers at bay. If I’m wrong, I would just pray that some source of infection would be found in our poor little Birdy. She’s been poked so many times that she’s not going to have any blood left and like I said before they just can’t find any infection that would explain her fevers. But whatever happens, I’m so grateful that our family is back together, and so thankfully that God answers prayers! Well Ava had a great day, I wish I could say the same thing about myself! It all started when I was sitting holding and rocking Ava around 9:15 am this morning in our room at the hospital, when I noticed a queer ache in my side. It quickly progressed to needing to put Ava down and going to sit on the bed/couch in the room, to having to lie down in the room, to having the cleaning lady in my room bringing me the garbage can so I could be sick. The pain on my flank and side was so incredibly bad that I texted my friend Tanya who was across the hall to come and she got the charge nurse to come see me. She noticed how white I was, and they took my blood pressure and then put me in a wheel chair and rushed me over to Toronto General hospital, which thankfully is just across the road. I was in agony and thankfully they got me in quick and stuck an IV in me and gave me morphine. Now I have had 5 children and have never had an epidural and I swear this pain was much much worse than child-birth, and that’s saying something. The morphine helped and I was conked out, but around 12:30 pm the pain subsided, right before they came to get me for an ultra-sound. They didn’t see anything on the ultra-sound, but the tech was pretty sure I had passed a kidney stone, as she could see some evidence even though she couldn’t see a stone. I eventually left the hospital at around 3:30 pm, without the Dr’s at Toronto General really saying anything, other than the ultra-sound had all been clear, so I went back to Sick Kids. But when I talked to Paula, Ava’s nurse practioner this afternoon, she thought that I definitely did have a kidney stone as she had one two years ago with the exact same symptoms. Can you believe it? I just have to praise God that I passed the stone in a matter of a few painful hours, rather than a few painful days, but I’m just in shock that I had one at all. Really, after everything else we are going through, I had to have kidney stone? 🙂 It’s cool though because our prayer team at church kicked in right away and I know that made a difference and I wanted to say thanks to everyone who was praying, thank-you and know that God heard your prayers! Ava had a good day today too and she’s got just the best smiles for us, but still is very dependant on her CPAP. Thanks again for your prayers, especially on day’s like today that contain too much excitement!